Earlier this month, the Israeli Aid NGO, IsraAID and Adam Smith International launched the first joint workshop for social workers and police personnel in Juba on developing a multi-agency response to Gender-based violence (GBV). The one-week program led to the establishment of the first joint steering committee between social workers and police personnel on combating sexual abuse and exploitation. After more than 40 years of conflict, displacement and poverty, the people of South Sudan are facing enormous social challenges. Violence against women is pervasive and has been exacerbated by decades of war that has left many children without a proper family structure, education or health care. A large portion of the population suffers from deep trauma that prevents them from being fully included in the development process. For some of the most deprived, prostitution has become a way of life and means of survival. The capital, Juba, is not spared from these challenges. On the contrary, sexual abuse, trafficking, and under-aged prostitution have dramatically increased due to rapid and uncontrolled urbanization. In particular the children in some slum areas are exposed to appalling and sustained sexual abuse. "Despite the magnitude of the problem in Juba, there is no effective prevention and response mechanism related to GBV,” says Ophelie Namiech, IsraAID's South Sudan Country Director. “A huge gap exists between the communities and the police, which is still perceived as abusive and corrupted by a large fringe of the population. Strong stigma against security and military authorities persists, and traditional practices tend to undermine the development of a coherent response framework on sexual violence." "In order to efficiently address the growing challenges related to sexual violence in Juba, it is essential to develop a comprehensive response mechanism that brings together the main actors working in this field," says Bill Morrell, Security Adviser at Adam Smith International, and a former British Police Officer. "Only by doing so will a true picture emerge of the scale of the problem that will enable Government leaders to identify effective prevention strategies." To that end, IsraAID and Adam Smith International/UK Aid (DFID) have developed a joint policy-making program for police, social workers, civil society organizations and human rights activists, whose objective was to produce key practical recommendations to improve the delivery of services in Juba related to sexual violence and human trafficking. This first joint training program led to the establishment of a joint committee that is now in charge of developing policies, strategies and actions to efficiently address Gender Based Violence in Juba. Joint actions that have been discussed include: the creation of joint police/social worker patrols, the development of a referral mechanism for survivors between police and social workers, an enhanced data collection system, and the establishment of a safe place for victims to receive police and psycho-social guidance. Social workers have, since the independence, played a crucial role in building the new nation, and addressing its most pressing social challenges. They are working with the most vulnerable communities, and therefore have the ability to create bridges between the population and the police. For the past year, IsraAID has been training the social workers of the Ministry of Social Development of Central Equatoria State and key service providers. Adam Smith International on behalf of UK Aid has been supporting the development of effective police services. The program, funded by the Ted Arison Family Foundation and the UJA Federation of Greater Toronto has been established in cooperation with the Ministry of Social Development of Central Equatorial State and South Sudan Police Services. 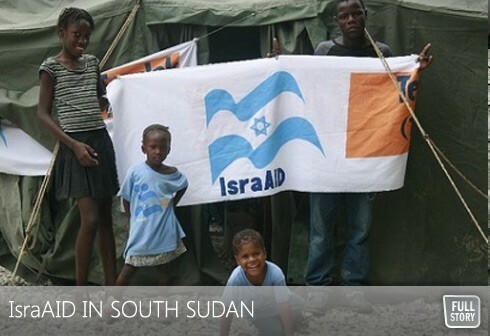 UJA Federation of Greater Toronto is IsraAID’s largest financial supporter.